A perfect guide for anyone new to the Virtualization space. Veteran users will be interested in the Operational Issues section. 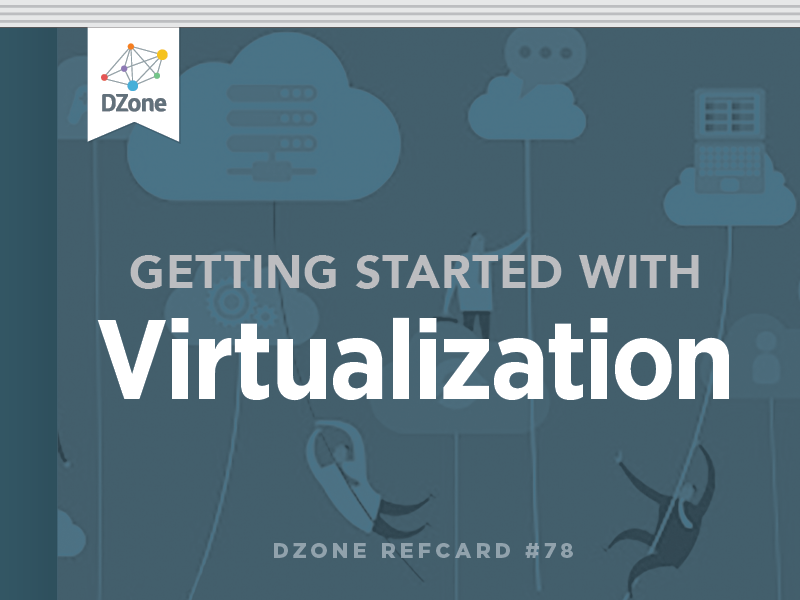 This Refcard, the first in a multi-part series on virtualization technologies, will cover Virtual Networking for Type 1 Hypervisors, specifically VMware ESX and ESXi. New Hardware Do you need new hardware in order to virtualize your environment. Peripherals If you are virtualizing systems that contain peripherals you may need to purchase additional hardware such as USB over IP devices. New Software Do you need to invest in different management agents and tools on top of the virtualization software. New Licensing Do you need to change your licensing for operating systems, and applications. New Management Do you need to invest in new management tools to properly manage your virtual environment. Training What training do administrators, users, and managers need to go through to use the virtual environment. Everyday Users should NOT know they are within a virtual environment. These items and many more are picked up by automated tools such as VMware Capacity Planner, Xcedex X-Factor, and Novell Power Recon. Those items with high CPU and IO Utilization numbers need to be carefully considered before virtualizing. For High IO Utilization you may wish to consider using VMDirectPath SCSI and Network connections within VMware ESX. Requirements for VMDirectPath devices could limit the number of VMs per Host and increase the number of required PCI-e/PCI-X slots required per host. Each VM added to a Virtualization Host affects the CPU, Network, and Disk performance of every other VM on the host. Consolidation ratios depend entirely on the workload to be used within the virtual environment. No two companies' workloads are the same, run your own tests. On average a host can run 6-8 single vCPU Server VMs per core and 11-12 single vCPU virtual desktops per core. For light loads more is possible. Consolidation ratios in many ways depend on the number of VMs you feel comfortable having in one host. For example, the average could be 30 VMs to 1 host. Depending on your high availability and redundancy requirements you may need 2-3 x the standard number of hosts. Virtualization hosts should contain enough memory so that workloads do not swap and therefore impact performance It should be noted that the performance of each individual VM affects every other VM. The use of VMware Fault Tolerance (FT) will reduce consolidation ratios as FT runs a shadow copy of VMs on other nodes within the VMware Clusters. CPU The amount of CPU assigned to any one virtual machine. When there is CPU contention VMware Dynamic Resource Scheduling can move the VM between hosts in the same VMware Cluster. Controlled by the number of CPU shares, MHz Reservation, and MHz Limit assigned to any one VM. Memory The amount of memory assigned to any one virtual machine. When there is memory contention VMware Dynamic Resource Scheduling can move the VM between hosts in the same VMware Cluster. Controlled by the number of Memory shares, RAM, and RAM Limit assigned to any one VM. Disk The amount of Disk IO assigned to any one virtual machine. Controlled by the number of Disk shares assigned to any one VM. Network The amount of network IO assigned to any one virtual switch port group. Controlled by Quality of Service controls per virtual switch port group. The Service Console also has shares, reservations, and limits: Service Console = CPU Shares: 500; CPU Reservation: 233MHz; CPU Limit: Unlimited; Memory Shares: 500; Memory Reservation: 0 MB; Memory Limit: Unlimited. Resource Pools are containers for VMs that can limit CPU and Memory that the contained VMs can use in total. There exists a Top Level Resource Pool that is the full amount of CPU and Memory resources available to the VMware Cluster. Resource Pools may apply CPU or Memory Limits to a pool of VMs and can also be nested as long as the definitions for CPU and Memory limits are reduced in the inner pools. For example, Pool C within Pool B can be defined with less CPU and Memory resources than Pool B. Lower Resource Pools can be expanded on the fly by borrowing resources from a parent pool. A VM placed outside Resource Pools will have more available resources than any VM within a Resource Pool if expandable is not selected. This confuses share calculation as total number of CPU and Memory Shares cannot exceed limits of resource pool into which the VMs and other Resource Pools have been placed except when pools are expandable.
' Require the use of Shared Storage such as NFS, iSCSI, or FC-SAN. Will not work with JUST local storage. VMware vMotion. Move VMs from Host to Host without powering off the VM. VMware Enhanced vMotion Capability. Allows for VMware vMotion between systems with slightly dissimilar but within the same family of processors. I.e. Intel and AMD but not between AMD or Intel. This functionality alleviates the need to set per VM CPU masks. VMware Storage VMotion. Move VMs from Datastore to Datastore without powering off the VM. VMware Dynamic Resource Scheduling (DRS). If there is any CPU or Memory Resource Contention either warn operator or automatically move VM using VMware vMotion. VMware Dynamic Power Management (DPM). Experimental in VMware Virtual Infrastructure. Fully Supported in VMware vSphere. Automatically moves VMs from less used Nodes using VMware vMotion so that this cluster nodes can be powered off during off-peak hours, and powered back on during peak hours. VMware High Availability (HA). If there is a VMware Cluster node crash, it will power on the VMs on other nodes of the cluster. Each VM will be crash consistent. Also works per crashed VM not just crashed host. VMware Fault Tolerance. If a VM crashes, VMware Fault Tolerance brings fully online a shadow copy of the VM. Use of VMware Clustering technologies will reduce your consolidation ratios based on your service level agreements. When using HA, you will need enough extra resources on your VMware Cluster nodes to run at least a full node's worth of VMs. When using FT, each VM takes up two times the normal resources.
' 80% is the magic number. Do not fill cluster nodes more than 80% (CPU, Disk, Memory) to handle sudden spikes in usage. This includes necessary extra resources to handle HA and FT.
Base component is the virtual switch (vSwitch). A vSwitch is a very simple Layer-2 device with a software CAM table. Virtual Distributed Switch is superset of the vSwitch. A container for identical vSwitches across all vSphere ESX/ESXi Hosts. Virtual Distributed Switches also add the ability to use Private VLANs and other security constructs. ESXi management appliance vmkernel device connects to portgroups per Figure 2. Virtual Networking encompasses redundancy, security, and performance. There should be 2 physical NICs per network/ trunk entering a VMware ESX or ESXi host for redundancy and performance. For the best security results, each virtual network security zone should be connected to different physical switching networks. Less than 4 physical NICs is considered insecure, lacking in redundancy, and will suffer performance degradations. Virtual Switches cannot be layered or connected directly to each other. There needs to be a VM between two virtual switches acting as a router, gateway, bridge, or firewall to connect to vSwitches. Draw out your virtual network to get an idea of how everything interconnects. Use of SR-IOV or VMware VMDirectPath bypasses the virtual switch and connects a VM direct to the pNIC. With 4 pNICs there is quite a bit of overlap between all the various networks and network performance would need to be considered. Each pNIC on vSwitch0 has several networks running over it so VLANs or subnets will be necessary. pNIC2 and 3 are used to give redundancy to the Virtual Machine Network. It is best when using less than 6 pNICs to choose to not use this configuration for a DMZ UNLESS pNIC2 and pNIC3 connect to separate physical switching networks due to the hostile nature of this network. With 6 pNICs some of the overlap disappears and you have enough pNIC to have both a standard virtual machine network as well as a DMZ. pNIC4 and pNIC5 are used to give redundancy to the Virtual Machine Network. In general, you want to have separate pSwitches to increase security from Layer-2 network attacks instead of using VLANs. Use of VLANs is a trust that your pSwitches are not susceptible to Layer-2 attacks. When you introduce a DMZ into the mix for 6 pNICS our virtual network looks like our standard 4 pNIC case for all but the DMZ which uses the extra 2 pNICs. pNIC2 and pNIC3 are used to give non-DMZ virtual machines redundancy. pNIC4 and pNIC5 are used to give redundancy to the DMZ Network. What makes this configuration work with a DMZ is the use of separate pSwitches for each pair of pNICs. This gives the virtual network security and redundancy. However, IP Storage performance can suffer.
' This does NOT work with the Cisco Nexus 1000V vSwitch. In addition to bridging between two Portgroups, if the VLAN ID of a portgroup is 4095, it acts as a SPAN port which receives all network packets on a given vSwitch. There are three 802.1q VLAN implementation methods within the vSwitch. They are defined by where the trunk of VLANs ends. Virtual Guest Tagging (VGT) The Trunk ends at a specific VM. This only works if the VLAN ID of the portgroup to which the VM is connected has a VLAN ID of 4095. Shared Storage is a requirement for the clustered attributes of VMware ESX/ESXi. Local Storage is often required for Business Continuity reasons. o Zero Thick: Default VMDK creation method on VI3. All blocks of the disk are allocated and zeroed when the VMDK is created. Zero Eager Thick: All blocks of the VMDK are allocated and zeroed when the VMDK is created. Thick: All the blocks of the VMDK are allocated but NOT zeroed when the VMDK is created. Zero Thin: Default VMDK creation method for vSphere. Only the start and end blocks of the VMDK are allocated and zeroed when the VMDK is created. After creation, as blocks are used in the VMDK, they are allocated and zeroed. Thin: Only the start and end blocks of the VMDK are allocated when the VMDK is created. After creation, as blocks are used in the VMDK, they are allocated but NOT zeroed. 2gbsparse: Transportable VMDK created using up to 2GB chunks. Each chunk will be a maximum of 2GB and contain only the blocks actually in use within the VMDK. Snapshot: A Snapshot is a special VMDK that links to an existing VMDK or Snapshot and contains only those Blocks that have changed from the linked and existing VMDK. Linked Clone: A Linked Clone is a special version of a snapshot that allows more than one VM to make snapshots of a given VMDK. RAW device or SCSI Passthru device using VMDirectPath or built-in RAW mode. This is mainly used for access to locally attached non-disk SCSI devices but can be used for access to a Local LUN. Virtual: A Virtual RDM has all the benefits of a VMDK. I.e. Locking is handled by the VMkernel and Snapshots can be created. Physical: A Physical RDM is a Passthru LUN with no controls applied by the vmkernel. I.e. Snapshots cannot be created. N_Port ID Virtualization (NPIV) is a special case of RDM and is used to setup per VM Zoning and Presentation within the FC-SAN fabric (Only works w/disk LUNs). The major concerns when using storage is Disk Utilization which could translate into Network Utilization when using IP Storage. Disk IO within the VMs As measured from outside the VM. While the in-VM numbers could match the out-VM numbers, the out-VM numbers depend on external clocks. Counters made within a VM expect a CPU to constantly be running within the VM, this is not necessarily the case. Number of VMs per LUN The standard thought is no more than 12 VMs per LUN. However, this may change if there are low utilization VMs or high utilization VMs. Size of the LUN The size of the LUN will determine the number of VMs that can fit per data store. The common thought is many smaller LUNs (600-700GB) instead of 1 large LUN. Settings on the HBA If you are using a FC-SAN it is important to have the proper Q-Depth number used for each LUN. Number of Spindles used for each RAID Set More spindles per RAID set imply better performance. However, for some SANs over 7 spindles has a performance decrease. Underlying Disk Type and Speeds SSD is faster than FC, which is faster than SCSI, which is faster than SAS which has a higher mean time before failure (MTBF) than SATA. Higher speed drives are very important; try to use 15K drives. SSD can have Stutter so it is important to get high quality SSD devices. When using FC-SAN or iSCSI Servers the most important item to avoid is SCSI Reservation Conflicts. SCSI Reservations occur when there are modifications to the metadata for any non-NFS data store. Metadata is changed when a file on the data store is created, modified, accessed (access time), or deleted. ESX alleviates this by limiting the number of simultaneous vMotions and Storage vMotions that are possible. Pretty much anything that modifies/creates/deletes a VM. Anti-Virus Scanning Full Disk scans should be staggered across all VMs within a VMware Cluster or Host. This is IO Intensive. Spyware Scanning Full Disk scans should be staggered across all VMs within a VMware Cluster or Host. This is Disk IO Intensive. Vulnerability Scanning Vulnerability Scanning without a VM implies using the Network and that could be Network IO intensive; from within a VM such a scan could be Disk IO Intensive. Configuration Management Initial computations of checksums for every file on a system could be CPU and Disk IO Intensive. Full Disk Scans could be Disk IO and CPU Intensive as well. Disk Defragmentation This is an IO intensive application and not recommended when using Linked Clones, as a Disk Defragmentation will touch every block of a disk, even those NOT in use. Thereby allocating the full disk and destroying the benefit of Linked Clones. Patching within a VM Patching within a VM has two issues. The first is that it can be Disk IO Intensive. The second is that patches often require a reboot which could cause Disk, Memory, and CPU issues if many VMs were to reboot at once. Stagger such reboots. Patching an ESX/ESXi host Without VMotion this task requires that VMs be powered off, moved off the host to be patched and then powered back on. For rolling updates without VMotion this could be many reboots. Patching Storage Arrays Without Storage VMotion, patching storage arrays requires powering off all VMs, migrating to other storage, and maybe powering the VMs back on. Use of Storage VMotion could alleviate the need for downtime, if there is a secondary data store available from another array. Package Installation Package Installation within a VM for many VMs at the same time could cause Disk IO issues. Stagger such package installations. Package Installation within a VMware ESX host does not require anything special. Creation, Modification, Deletion of VMs Creation of a VM has a Disk IO intensive component and will cause a SCSI Reservation to be requested. Once the VMDK is created, Disk IO issues cease. Modification of a VM may require powering off a VM and then powering it back on to gain the benefit of the change. This will cause a SCSI Reservation to be requested. Deletion of a VM could be Disk IO intensive for many VMs at the same time. This will cause a SCSI Reservation to be requested. Performance Performance monitoring depends on CPU counters which depend on the full number of cycles within a VM's vCPU which is not always the case which implies that performance numbers from within a VM is more a gauge then true numbers. Gather performance data from without the VM. State The state of the VM, its network devices, etc. can be found within or without a VM. Inventory/Assess Management This would occur from within a VM. Security Security monitoring or auditing must take place from within the VM for Guest OS Hardening, and without the VM for VM specific security settings. vNetwork Virtual Network API used by the Cisco Nexus 1000V switch. Network monitoring would occur at the vSwitch level and be performed without the VM. vStorage Virtual Storage API used by the EMC PowerPath VE product allows storage vendors to use the multipath plugin functionality to provide functionality and gather better disk IO statistics. Anti-virus and Anti-spyware vendors can also directly read a VMDK without the VM needing to be powered on. vCompute Virtual Compute API can be used to gather better performance numbers for individual VMs or vCPUs. vMemory Virtual Memory API will be used by Anti-Virus and Anti-Spyware vendors to quarantine reads and writes to parts of the memory of a VM. VMsafe VMsafe moves Security monitoring into the VMkernel. The most common use as of now is to provide virtual firewall at the vSwitch level and not as an inline device between virtual switches. Installing ESX is a 19 step process with only 1 step being the actual installation. Always important as it contains information that may be necessary to know for installing ESX/ESXi. Read all relevant documentation (including the ESX Installation Guide, Storage Array Documentation, etc.) Read the Fine Manuals as they have important information to know on configuring ESX/ESXi or storage devices. Verify that your Server, IO Devices, etc are on the VMware HCL. The VMware HCL contains information on what levels of firmware, location of drivers, and other necessary to know information prior to installation. Run Vendor diagnostics for at least 24 - 48 hours ignoring all disk timeout tests. VMware ESX/ESXi taxes hardware like no other operating system. It is important to have good working hardware to start. Run memtest86+ for at least 24 - 48 hours. Memory issues will cause crashes to your ESX/ESXi host. Always verify. Upgrade firmware to at least the minimum supported levels--usually the latest. This information comes from the HCL. Down level firmware and BIOS could cause difficult to debug crashes of ESX/ESXi. Verify the BIOS settings for the server are appropriate according to the hardware vendor documentation. Incorrect BIOS settings will deny the ability to use EVC, run 64 Bit VMs, and cause difficult to debug crashes. Determine Boot Disk location: Local, SAN, or iSCSI? Boot From SAN while possible is not always recommended. But often requires special Storage configurations to make happen. Retrieve VMware ESX/ESXi server licenses. Needed during install, but could be added after the fact. Retrieve Virtual Machine License and installation materials. Only necessary if installing VMs immediately. Retrieve Service Console/Management Appliance network information (Static IP Address, Hostname and Fully Qualified Domain Name, Network Mask, Gateway, and DNS server addresses). Necessary to perform install. Retrieve VMkernel network information (Static IP Address, Network Mask, and Gateway). Determine service console swap size and thereby the service console memory size. Generally the swap size is 2 x memory size. The maximum size is 2000MBs. 800MBs is the recommended size of Service Console memory. The virtual networking required (drawn out for easy implementation). Your virtual network diagram/design is required to configure your host and will help with installation. vSwitch Portgroup/Network labels to use within the virtual network. Common portgroup labels are required across all your VMware ESX/ ESXi hosts within the same cluster. VLANs required for each vSwitch Portgroup. If you are using VST you need to know your VLANs as one may be needed during installation. Collect World Wide Port Names if using FC-SAN HBAs. This is necessary to zone and present LUNs to the ESX host. If necessary, configure FC/iSCSI HBA for boot from SAN. For Boot From SAN you are required to configure the FC/iSCSI HBA to enable disk boot BIOS to be available. At this time you have enough information to install VMware ESX or ESXi. Connect to the ESX/ESXi host for the first time and create administrative user (non-root). Install any additional ESX or ESXi packages. Join ESX/ESXi host to vCenter Server. IDE Controllers Used for IDE Disks and CD-ROMs. Up to 4 devices available. Up to 4 SCSI Controllers available per VM. PVSCSI driver can only be used for NON-Boot Disks. VMDirectPath SCSI is also available. Up to 10 vNICs available within vSphere, only 4 within VI3. vmxnet3 required to achieve 10GB speeds. Without the VM, Flexible Network Adapter is selected. Driver within the VM determines what device is in use (PCNet32 or vmxnet). Guest Operating System in use will determine if e1000 is available. IDE or SCSI Disks Per the formats given under the storage subsection. Up to 4 IDE CD-ROM or Disks available. Up to 60 SCSI Devices available 4 controllers w/15 devices each. SCSI Devices Using SCSI Passthru or VMDirectPath to access attached SCSI devices like Tape Libraries, Tape Drives, and other SCSI devices. SCSI ID within VM should match SCSI ID of SCSI Passthru device. IDE CD-ROMs Up to 4 CD-ROM and IDE disks allowed. Floppy Up to 2 Floppy devices allowed. Memory Up to 64GBs available. CPU 1, 2, 4, or 8 vCPUs available. 8 vCPUs requires Enterprise Plus licensing for vSphere. Video Monitor Memory for Video graphics adapter shared with Guest operating system assigned memory. Serial Ports Passthru to the Virtualization Host serial port using service console serial port pipeline. USB Devices (vSphere Only, does NOT work in ESX/ESXI 4.0) Passthru to the Virtualization Host USB devices. Allows Virtualization Host to query parts of the VM without using the network. Impossible to remove, it is ALWAYS there. Any network method to transfer a device from one host to another host is supported over IP. This depends on the Guest OS not ESX or ESXi. Security is incredibly important. Work with your Security Team. VMware vSphereTM and Virtual Infrastructure Security: Securing the Virtual Environment published July 2009, Copyright 2009 Pearson Education.